The show Freedom from Disturbance by Michael Murray displays a wonderful body of work by an artist who combines a photographic talent with novel print-making methods that present a powerful exhibit. Michael, with roots in Rochester and currently working from his studio in New York City, describes his work "I do photographic image transfers onto wood panels; when the ink and plaster-gelatin mix dry, the piece is, in essence, a fresco. The process from beginning to end takes about one week." Michael has a brief video describing aspects of his print-making on his blog, click here to see it. Please make a point of seeing the show that Peter Marr describes as "excellent and intriguing....in a unique and eye-catching way." In addition, we have a number of guest photographers exhibiting in this show: Augustine J. Masotti is in the East Gallery, Scott Kipphut, Steve Malloy Desormeaux, Tom McGlynn, and Georgia Nesmith. Camera Rochester photographers Sue Alden, Ron Gouger, Jeno Horvath, Steve Malloy Desormeaux, David Ridley, and Gail Rivera are exhibiting club-competion winners. We round out the show with Artists-in-Residence, Jim Patton and David Perlman, and Gallery Partners, Daniel P. Crozet, Joel Krenis, Don Menges, Dan Neuberger, Betsy Phillips, Gary Thompson, Phyllis Thompson, Sheridan Vincent, and George Wallace. A total of 22 photographers present a wide-ranging photographic experience. For full details of the show click here where you will find a link for our "Preview of the Show" and also the Peter's Picks link. We are fortunate each show to have Peter Marr review all of the photographs in the exhibit by the featured and guest photographers and to then select his "Picks" of the show. Excerpts from Peter's discussion are included here in the newsletter, but, you will want to go to the webpage link to see larger images and the full write-up; and, even better, be sure to visit the gallery to see them in person. Peter chose two photographs by Michael Murray. The first, Room, Olson House, is shown in the lead article of the newsletter. 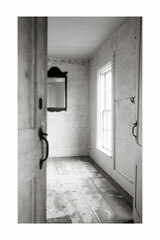 Peter comments "This powerful, vertical view of part of an empty room, is seen through the eyes of partially opened double doors, the left hand door being significantly out of focus....There is an irresistible magnetic pull in our minds as to what lays beyond the half-opened door." Peter's second choice of Michael Murray's work is Before the Fall 2, -shown at left- "a truly sublime, idyllic, and wistful portrait that captures the mystery and imagination of perhaps past scenarios, life as it is now, or of a distant unknown future. Hauntingly reminiscent of an Andrew Wyeth painting, this evocative image has a tranquility and beauty that is just enthralling." 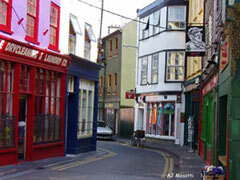 The third of Peter's Picks is by Augustine J. Masotti, titled Kinsale, Ireland, -shown at right- Peter makes the comment that "The photographer is to be admired and complemented for beautifully capturing this fascinating part of an old Irish town, in such a meaningful and delightful manner." With his next Peter's Pick selection Peter comments that with Beach Blues #1 and #2 by Tom McGlynn "both pictures have resplendent color and superb detail, and an exquisite artistic quality that is very reminiscent of pastel pencil renderings, particularly evidenced in the background beach sand...in Beach Blues #2 -shown at left- where the sibling blue stones appear to be lovingly protecting the mother-figure white pebble. The entertaining kelp envelopes and enwraps the whole family, providing a calming, nurturing and supportive element. Even the lines and forms of the sand particles weave a curtain of support and tranquility. I really love these two beautiful prints." Peter also picked two photographs by Steve Malloy Desoreaux Morning at Hemlock Lake -shown at right- and Twilight at Stony Brook and commented on the first one that "the early morning mist enveloping the picturesque shoreline, reaches up into the dramatic sky, the entire scene being nourished by a palette of soft colors and gracefully reflected in the pristine water." With each of his efforts, we thank Peter Marr for his continuing contributions to Image City and his insight and entertaining discussions with "Peter's Picks." A trapping to which photographers often succumb is overvaluing images that were difficult to obtain, and undervaluing images that were easy to acquire. If one hikes four miles back into a canyon, takes two hours shooting many different images from precarious vantage points of a water fall, and then hikes the four miles back out of the canyon in a rain storm, there is a likelihood that the images obtained are going to be overrated by the photographer. Conversely, if a photographer is able to jump out of his or her vehicle and take a couple quick images of something, there is a definite tendency to undervalue these images because they were so easy to obtain. The reality is that other people will evaluate an image by its quality, totally independent of its history of capture. Therefore, it is important when editing your work to disregard how easy or difficult it was to capture images. Photographs need to be evaluated based on their quality as a product without regard to their history of acquisition. 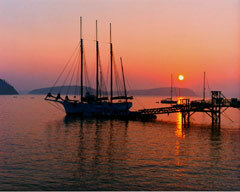 My example image of the Margaret Todd Schooner in Bar Harbor, ME was easy to capture and I initially undervalued it. Friends and customers encouraged me to print it.I did so and it has sold well. Click Here to see a larger image of Margaret Todd at Sunrise and to review the other photographs in the series and the tips Gary has written. 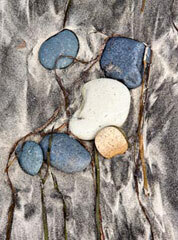 Juried Exhibit for all local photographic artists. All local photographers will be pleased to learn of another wonderful opportunity to submit work for the juried show A Photographer's Path 13, a Fine Art Photography Exhibit at High Falls Gallery in partnership with Community Darkroom of Genesee Center for the Arts and Education. In its 13th year, it is always a great exhibit in the City of Rochester's art gallery. Click Here for a PDF documenting the details and the entry form. Submissions are to be dropped off on February 10 - 14. The exhibit will run from March 21 to April 30, 2010. For questions contact Sally Wood Winslow at High Falls Gallery 325-2030 or Sharon Turner at Community Darkroom 271-5920.